CONDITIONS OF SALE: AbFab will only accept cash for this painting. STORY: The international symbol for peace, originally designed for the British nuclear disarmament movement in 1958, is here used in a negative context. 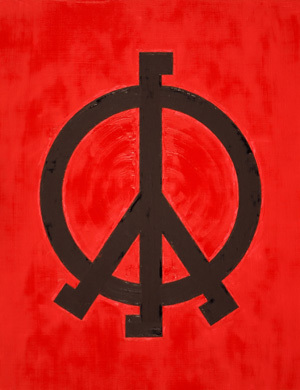 However, the AbFab painting has nothing to do with its similarity to a symbol used by the Nazis, nor with a popular belief on the political right that it represents a broken cross (i.e. an anti-Christian symbol). It is just a reminder to the human race that peace is an illusion. Every day, in every corner of the globe, humans kill, molest, and oppress other humans. A long peace at any cost is sometimes worse than a short and productive armed conflict, because it is less harmful to the human spirit and its creativity. This is probably what Nietzsche meant by: "Ye shall love peace as a means to new wars — and the short peace more than the long". There is nothing more hypocritical than powerful nations supporting dictators for decades as means of securing peace in a certain regions, just so their oil supply would remain cheep and uninterrupted. As an added bonus, dictators kill millions of their own nationals, in extremely peaceful conditions. Anti-war protestors should keep that in mind next time they march, because there is nothing more attractive than stability when you are on the top and change when you are on the bottom. Asking price and preferred buyer suggest that absolute peace and justice are usually beyond reach.